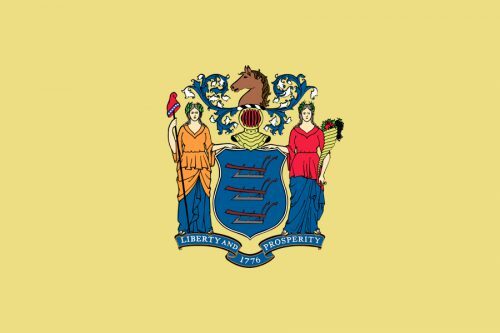 The New Jersey State flag displays the official State colors. 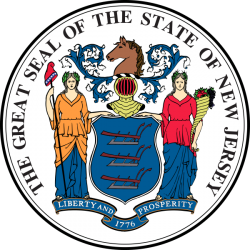 The State seal is presented in Jersey blue on a buff background. The colors were chosen by General George Washington in 1779, after he was headquartered in New Jersey during the Revolutionary war. These were the military colors used by the New Jersey troops. The State seal is in the center of the flag. It was designed by Pierre Eugene du Simitiere and presented in May of 1777. The horse head stands for speed and strength. The helmet of a knight’s suit of armor faces forward representing sovereignty for a state that governs itself. Below the helmet is a shield with plows on it. The plows show the importance of agriculture to the state’s economic power. There are three of them to represent that New Jersey was third to join the United States of America.